The K6 fills an important space in modern tour sound amplification, yet it does not use up much room in its single rack space chassis. Absolutely stable with 2? loads, it fits subs in smaller systems as well as lows and mids in larger setups. More power is available if needed: Per Step-up card a K6 can be upgraded to become a K8, making it a safe investment – more power without replacing the entire amplifier. 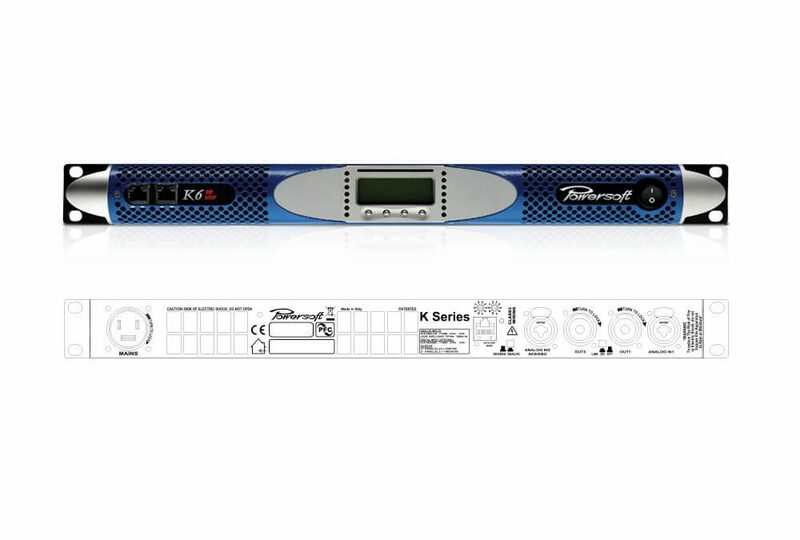 Fully digitally controlled and with a serial PC communication port as standard, the K6 is also available with KDSP board and KAESOP Ethernet/AES3 interface: the K6 DSP+AESOP amounts to a fully integrated, highly sophisticated yet easy to use power source including state-of-the-art sound shaping and system management capabilities, remotely controllable via Powersoft’s Armonía Pro Audio Suite™ (Interface available for MediaMatrix, Crestron, AMX, Q-SYS control and monitoring systems).